How do I install this product for Windows? The example explains how to install the QR Code Font and Encoder Package and generate barcodes in Crystal Reports. 3. Continue through the Extraction process. 4. 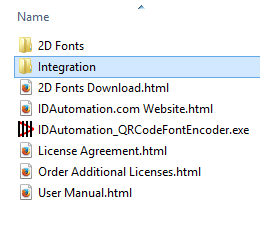 To install the Font (IDAutomation2D) and encoders, double-click the IDAutomation_QRCodeFontEncoder.exe and run through the installation process. 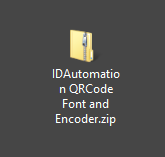 Return to the unzipped IDAutomation QRCode Font and Encoder folder, and open the IDAutomation_QRCodeFontEncoder folder. The Integration folder includes file examples as well as links to user guides.